Most or all playfield top-side rubber parts that come in contact with the ball (see note below). Listing of kit parts and quantities used. Diagram showing locations of all parts supplied in the kit. Ring sizing chart for quick ring ID. Kit Colors: Select above when ordering. Default colors are factory-original colors for this game (some colors may vary depending on availability). 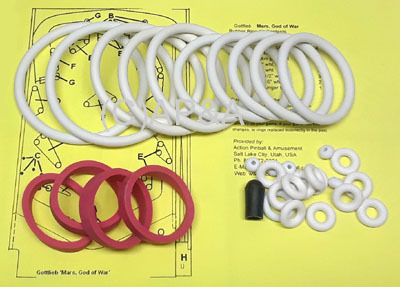 Our rubber kits include (where applicable) most or all ball-contact rubber parts on the top side of the playfield, including regular round rings, post bumpers, sleeve bumpers, mini post rings, flipper rings, ball shooter tip, and top arch rebound bumper. Rings for mini-posts on tops of plastics and ramps are also included for games that use them. If you have a question about anything that may or may not be included in a kit, please ask before ordering.